Every year we like to take some time to look back on the previous 12 months and select some of our favorite moments in the higher education digital space. 2017 was a year where we saw universities embrace the student voice. We saw student takeovers on Instagram and Snapchat and we saw video continue to dominate as one of the most effective communication methods. 2017 was also a year where we saw the rise of Instagram Stories and the arguable fall of Snapchat. On a personal level, 2017 was a year where TERMINLFOUR continued to thrive; we now work with over 200 Universities and Colleges across 13 countries, we released our 4th Annual Higher Education Digital Marketing and Web report and we released version 8.2 of our Digital Marketing and Web Content Management Platform – TERMINALFOUR 8.2. We continued to work with some of the most innovative and renowned higher education institutions around the globe and we welcomed many new universities and colleges to the TERMINALFOUR community. 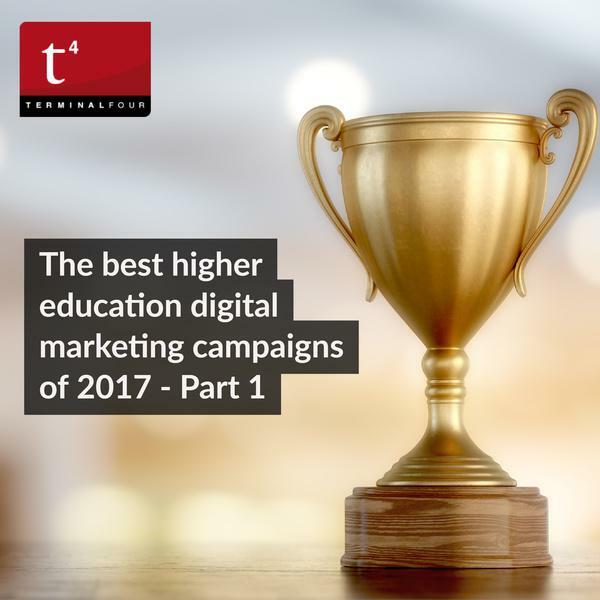 As an organisation, we look forward to what 2018 will bring and one thing we do know for sure is that we're sure to see some incredible campaigns, initiatives and digital marketing leadership from universities and colleges around the globe. Over the next two blog posts, we will look back on 10 of the most memorable social media and digital marketing moments from 2017. Some are quirky, some are downright bonkers but they all succeeded to capture our attention! In April 2017, the University of Tennessee, Knoxville had some big success by tagging the Queen of Country, Dolly Parton. Dolly holds a special place in the hearts of the people of East-Tennessee, having been born just down the road, an hour away. The university were holding a course called 'Dolly's America' which looked at Appalachian history through the lens of Dolly Parton. The class examined how a girl from Appalachia grew up to become an international one-word sensation. The university featured the class in their magazine, torchbearer, shared it on their Twitter account and tagged Dolly in. Just a few days later, Dolly Parton's account retweeted this reply to her 4.5 million followers and from there things kind of exploded. After this, Dolly's website featured an article on the course and it even reached the ears of the NY Times, the BBC and the Wall Street Journal. This is one of the best examples of the power of social media we came across last year! We blogged about this back in June, take a look. Many of you will be familiar with 'Carpool Karaoke', the recurring segment on The Late Late Show with James Corden, where he gives celebrities like Adele, Mariah Carey and the Red Hot Chilli Peppers a ride, and they sing along to their hits on their radio. We loved it when the University of Wisconsin at Milwaukee showed their sense of humour and commitment to the grandiosity of commencement with a video showing Chancellor Mark Mone giving some students a "Carpool Karaoke" ride to the ceremony. Take a look at our original blog here. We're making a special allowance for one or two entries this year. Technically, this spectacular Time-lapse video was first released in 2014 but we came across it late in 2017 and were blown away. Set to the music "Tinsel and Tiaras" by Ray Davies, the University of Cambridge created a time-lapse day-in-the-life video to celebrate the magic of Cambridge. The video features breathtaking views of the iconic city and University. This video proves that if you make something that's timeless in its simplicity, it can serve you very well indeed. This video has been viewed on YouTube almost 18,000 times. One of our favorite higher education milestones occurs every summer with the arrival of clearing season. Each year, universities and colleges in the UK outdo themselves with eye-catching clearing campaigns. We will be including one or two of these in our countdown and we couldn't not mention this one from the University of Gloucestershire. Prospective computing students were asked to fill out a personality based quiz with questions like 'what would does C++ mean to you', 'would you rather take something apart or put something together' and 'when working in a team which role do you typically adopt'? Once students filled out the quiz, they were asked to enter in their details including email addresses, phone numbers, whether they would like a prospectus sent to them and were then presented with their personalized page with detailed information on suitable courses and likely careers. Take a look at our blog post on this ground-breaking campaign. Humans of NOC is a project inspired by the Humans of New York. While lots of colleges have adapted the Humans of New York style approach, we thought this one deserved its own special mention. Humans of NOC has its own dedicated section on the NOC website, there's a clever online form where you can suggest a human to be featured. Above all, it features some truly moving and inspiring stories from the humans that make up the Northern family. Lose yourself in the Humans of NOC here.